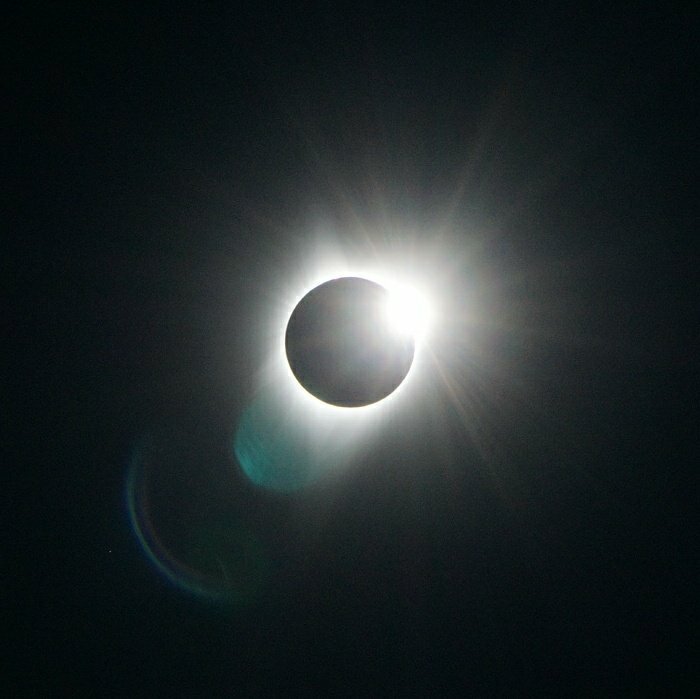 As mentioned in my previous post I had the opportunity to go down to Oregon to see the total solar eclipse. It was well worth the trip down and the traffic up as seeing the entirety of the eclipse was very different than the 93% in Seattle or the 99% in Portland. Though stock was scarce I managed to get a solar filter for my camera and setup with a tripod and a telephoto lens to capture this astronomical oddity. Just after C1 first photo I was able to capture as I was formatting my camera card as first contact was made to make room for all the eclipse photos. About half an hour latter the moon is nearing the half way point. Around this time it starts getting noticeably cooler. Through the camera or eclipse glasses the sun is now a sliver behind the moon. Without the glasses the only noticeable change is that sun light seems dimmer. This is about as much of the eclipse would have been seen in Seattle. The sun gets smaller and smaller. This is about the extent of the eclipse that would have been seen from Portland. An interesting phenomenon know as Bailey’s Beads. The last rays of sunlight are sneaking through the mountains and valleys of the moon, making the appearance of a string of beads. Totality. Now the glasses and solar filters can come off as the sun is completely eclipsed by the moon for 1 minute and 44 seconds. In the sky there is a black circle surrounded by white rays which is the sun corona, only visible to the human eye during a total eclipse. Stars are visible and the entire horizon looks like a sunrise. As C3 passes the total eclipse ends I sneak a picture of the ‘Diamond Ring’ before putting the solar filter back on the camera. The sun is back to being a sliver, and the entire process reverses its self. Around this point we did notice some light Shadow bands snaking across the ground. Currently stuck participating as a member of unending traffic coming back from Corvallis, OR. I was in Oregon to see the full total ecipse. It was an amazing experience, and I have a lot of photos to go through, but here is a quick favorite. As mentioned in my previous post on pens I like to carry a writing instrument on me as part of my everyday carry. In school I always had a mechanical pencil, moving into pens I first tried roller-ball then felt-tip pens before landing on fountain pens. Fountain pens have many advantages over other types of pens, but being pocket safe is not one of them. Because they use liquid ink drips or leaks can cause a lot of damage (think of the opening to Shawn of the Dead). Last century wanting safety from leaky pens was such a necessity that people would line their shirt pockets with plastic envelopes bring us the dweebish stigma around the pocket protector. Luckily today the fountain pen enthusiast has better options. A large point of not spilling your ink is how you are filling your ink. Older fountain pens used latex bladders or lever activated pistons to pull ink directly into the barrel of the pen. Now it is much more common to insert a small ink filled plastic cartridge or a converter which uses a screw piston. These ink distribution methods are much more reliable and will prevent ink from seeping out of the pen. But that’s not good enough for a pen that I want to throw in my pocked with my keys and other things. The Liliput is nearly the perfect pocket pen. It adds protection by having a twist off cap that will never come off in your pocket, and will never let ink out. Coming in at a little under four inches capped its a pocket-able aluminium ink fortress. But its only nearly perfect. Being small, slippery, and perfectly round this pen wants to roll of and get lost. To be truly useful this pen needs a clip. There are clips make by Kaweco for this pen, though the selection is very limited. Instead I tried fabricating my own. I have a 3D printer, but the nature of a pen clip makes it difficult to print on a 3D printer. Printing a ring to fit around the pen was easy enough, but attaching a clip to it introduces structural weakness that will not stand up to being pocketed over and over again. This has to do with the direction of layers, for the ring having the layers perpendicular to the pen makes printing the shape simple. For the clip the layers should be oriented parallel to the pen otherwise the clip will just snap off at the weak layer joins. I printed the ring to fit around the pen and then looked to some model making techniques to finish the clip. I happened to have some very fine brass rods around that would make a durable, but flexible pen clip. Using a very small drill I made inserts for the ends of the brass rod and bent it them glued it into place. A little bit of sanding to smooth out the printed plastic and I have a very functional clip for my favorite pen. Now this little pen is perfect for a pant for shirt pocket. With the oblong shape of the plastic ring it also no longer rolls away! With this clip I have been carrying the pen around for a few weeks now. Haven’t lost it and no spills! I’ve also got a rather odd way of filling this mini pen to maximize the amount of ink it will hold, but that’s a story for another time.